Watch Sister Imperator, Chris Jericho, Kirk Hammett, Charlie Benante, Mike Mckenna, Aleister Black, Jessica Pimentel, Chino Moreno, Josh Barnett, Bethany Cosentino, Phil Anselmo, Young Sister Imperator, And Matt Shadows React To The Track From The Band's Forthcoming Album "Prequelle"
Grammy® Award-winning rock band Ghost today released "Dance Macabre", the second track off the forthcoming fourth sacred psalm "Prequelle." The song is available to stream and download now HERE. 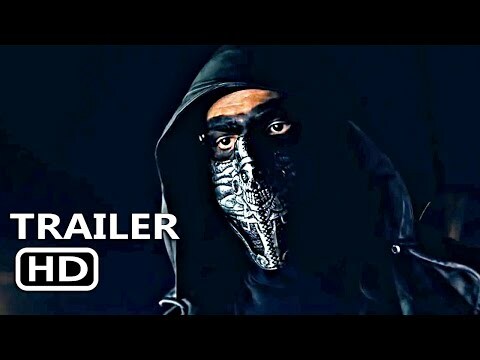 Ghost treated fans to an early listen of the track, premiering it in its entirety on May 17 in a series of Instagram Stories featuring Sister Imperator, Chris Jericho, Kirk Hammett, Charlie Benante, Mike Mckenna, Aleister Black, Jessica Pimentel, Chino Moreno, Josh Barnett, Bethany Cosentino, Phil Anselmo, Young Sister Imperator, and Matt Shadows. "Prequelle" (pronounced prē-KWELL)is due for release on June 1 via Loma Vista Recordings. The album is available for pre-order now HERE. Limited edition bundles featuring deluxe, colored vinyl, 8-track cartridge, cassette tape, "Rats" die cut picturedisc, plague mask, musical eucharist case, pins, and more available exclusively in the Ghost Shop HERE. Fans who pre-order the album will receive instant downloads of "Dance Macabre" and the album's lead single "Rats". "Prequelle" follows Ghost's third studio album "Meliora" and its accompanying EP "Popestar," which elevated the Swedish rock band into the pantheon of the greatest rock bands on earth and resulted in a Grammy® Award for 'Best Metal Performance'. "Meliora" debuted at No. 1 at Independent Retail, No. 2 at Rock, and in the Top 10 on Billboard's Top 200 Album Chart, selling over a quarter million copies globally. The band made their network television debut performing the album's lead single "Cirice" on CBS's The Late Show with Stephen Colbert. Popestar debuted at the No. 1 position on Billboard's Top Rock Albums and Hard Rock Albums chart and produced an Active Rock chart topper with "Square Hammer". 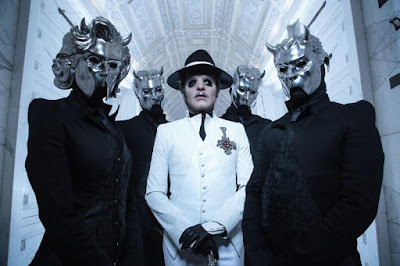 Last month Ghost announced their first-ever headline arena dates with a press conference helmed by Papa Nihil and Sister Imperator at Irving Plaza in New York City. The band will perform at The Forum in Los Angeles, CA on November 16, and Barclays Center in Brooklyn, NY on December 15. Ghost is currently on the road in the US for their Rats On The Road Tour. The band kicked off its 2018-2019 world tour earlier this month with their Rats On The Strip secret show and pop up at the Roxy in Los Angeles. A complete list of upcoming live dates and ticket information can be found HERE.